A focal point of Second Nature is the monumental work Bird that spans ten by fifteen feet. Multiple sheets of painted paper make up the image of a huge crane that hangs upside-down with a bent leg and majestic, outstretched wings. Reed poses questions for the viewer: what incident has led to this graceful creature’s treacherous state? Was this hazard caused by humans? The bird’s open eye leads the viewer to question its demise. Moral messages and lessons may be found in the historic paintings that inform these contemporary interpretations. In Bird Concert, an unlikely congregation of bird species, in all shapes and sizes, creates a disconcerting narrative. It’s as if a perilous act has forced these fowl to occupy this compressed space. Surveying the menagerie of agitated birds, it seems that the loudest screech by the biggest bird overshadows the song of others. In light of the nation’s current divisive political climate, Reed’s composition reveals a timely message. The birds are stand-ins for a chorus of humans—the individual voice drowned out by a cacophony of clamoring and opposing rants. The hand of man undoubtedly plays a fundamental role in all this animal theater. 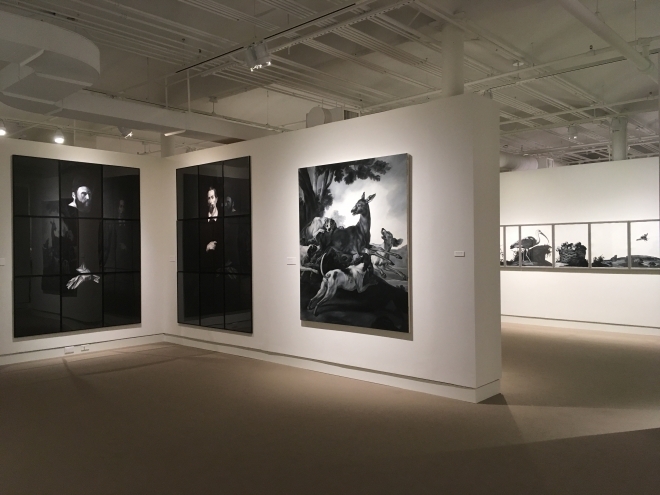 In the exhibition, Reed has included two dramatic paintings of men as a reminder that we are both members and encroachers in the natural world.